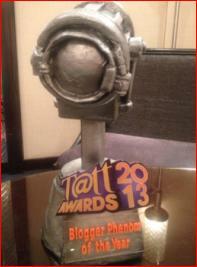 FOR THE first time, I missed the annual Tatt Awards. Too bad ‘cause I wasn’t there to personally receive the recognition bestowed on this blog. I will not mention the category. It’s scary. Being called such makes me cringe. I’m a blogger. I’m happy with that. And to borrow Ms Jessica Soho’s line, “This should not be about me.” It should be about the blog. To the Tatt Council (jurors), and to all READERS who gave their support… THANK YOU so much. To the organizers, maraming salamat. I feel great. Ito yong feeling na nararamdaman ng Maynilad at Manila Water Company – ‘yong tipong libre lahat: income tax, advertising, foreign trips, entertainment and recreation etc. Suwerte! I feel lucky. In the 2011 Tatt Awards, I won in the category WordSlayer. I was up against better writers. A friend quipped, “That win was a miracle!” Last night, another miracle happened. That’s two miracles. Take that Pope John Paul II! I feel awesome. I just won. Your turn… Lakers! By the way, there’s no truth to rumors that Vice President Binay, who declared his intention to run for president (in 2016) as early as 2010 – was given a special citation called A-Tatt Award. Tsismis lang. Muli, maraming salamat po sa inyong lahat. You know who you are. Ang pagkilala sa blog na ito ay para sa bawat Finoy o Finay sa loob at labas ng Filipinas. Mavuhay! People get the politicians they deserve – politicians get the satire they merit – writers get the awards they earn. what else can i say — congratulations for being a phenomenon! congrats!!! u really deserve it, idol!!! Blogger Phenom of the Year! Well-deserved! Congratulations heckler !!! Keep it coming !!! congrats Mr. H ..truly deserves it! !